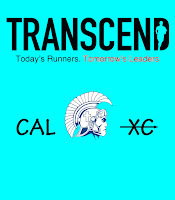 Below is this years 2015 CAL XC spirit wear design with these changes. -The Centurion Head with be black and not navy blue. The white background will be removed and the color of the shirt will bleed through on the centurion head as well. -The order forms are below. You will need a hard copy order form (no online ordering. I'm not Amazon...yet), so download and print the order form here or I also will be handing out order forms at practice. . There are a lot of items that will be offered. The color choices will be blue or a heather gray. The heather gray items will have blue writing instead of the black as depicted below. Orders are due back into me (Coach D : - ) ) by Thu Sep 10th.